Will there be war with Ukraine? Russian military experts weigh in on the likelihood of armed conflict between Russia and Ukraine. The upper house of Russia’s parliament has given President Vladimir Putin the authority to use force in Ukraine. Russian military experts do not have a unified opinion on what could happen next. Some believe the Ukrainian military is not prepared to fight Russia while others think that a full-scale invasion would result in a long, drawn-out conflict. Analysts also noted that there are political issues in Ukraine that could affect the likelihood of major fighting. Military analyst Pavel Felgenhauer says that a large-scale invasion of Ukraine would be a losing proposition for Russia. “Compared to the situation in Ukraine, the Chechen war would look like a picnic. There are 40 million Ukrainians, compared to just one million Chechens, and now they have someone to unite against,” Felgenhauer said. Felgenhauer added that in his opinion, the West will introduce economic sanctions against Russia in the event that Russian troops move into Ukraine. The opinion of Ruslan Pukhov, head of the Center for Analysis of Strategies and Technologies, is at odds with that of Felgenhauer. In Pukhov’s assessment, Ukrainian troops would be unable to put up armed resistance to the Russian army and would also not be inclined to do so. “The Ukrainian army, which was formed in 1992 on the ruins of the Soviet Union, had huge numbers and best weapons and hardware, but over the past 22 years it has degenerated. Morale has been steadily falling, the best weapons were sold abroad, for example, to Georgia, so now the country’s army is no longer a serious force to be reckoned with,” Pukhov said. “The last two nails in the coffin of the Ukrainian army as a combat force were the Russian military reform that started in 2008 and last year’s transition to a fully professional army in Ukraine. In the former case, the Ukrainians saw that while their degradation continued, Russia had begun to make large-scale investment in defense and the very attitude to the army there had changed. In the latter, instead of conscripts the Ukrainian army is now made up of contract servicemen. 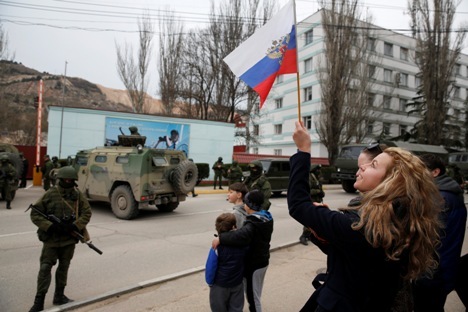 So now military units in Crimea are manned not by conscripts from Lviv but by local guys, who have no intention of fighting with Russians,” Pukhov said. He added that over the past 20 years, the Russian army had taken part in several armed conflicts, which has kept them battle-ready, while Ukrainian troops haven’t been involved in any. Igor Korotchenko, the editor-in-chief of the magazine National Defense, said that even if they are ordered to defend Ukraine against a Russian invasion, Ukrainian army and law-enforcement agencies do not have to follow any orders of the new Ukrainian authorities. He also called for caution when reading media reports of Russian military action in Ukraine, as the members of Russia’s Black Sea Fleet are already in the country under a long-standing agreement and so far no other Russian military units have been sighted in Ukraine. “An information war is being waged against Russia and all reports should be treated with caution. The fact remains that Putin has been granted a lawful right to send troops to Ukraine. Let’s wait for some official steps from the Defense Ministry. As regards a possible military operation, I think it will be only in Crimea, although I do not rule out a broader involvement either. Everything will depend on how the situation will develop,” he said. Korotchenko agreed with Pukhov that the Ukrainian army was currently not in a state of combat readiness. “The Ukrainian armed forces are currently unable to conduct combat operations. Almost all units, perhaps with the exception of special-purpose units and paratroopers, are simply not capable of undertaking any active operations. They sat in the barracks when Yanukovych was being deposed, while in the west of the country they even allowed opposition supporters to get hold of arms. That is why I would not consider the Ukrainian army as a military force,” Korotchenko said. Anatoly Tsyganok, head of the Center for Military Forecasting, Anatoly Tsyganok, is convinced that things may not go as far as real military clashes. “We have released a trial balloon. Now one needs to watch what NATO and China will do. We are interested in cooperation with China, which is not very well disposed towards the revolutionary authorities in Ukraine,” Tsyganok said. He also compared the latest developments to the Soviet invasion of Czechoslovakia in 1968. “Over 45 years ago, I took part in the events in Czechoslovakia. We spent three months in columns: June, July and August. A similar situation may happen now,” Tsyganok said.